Men's quarterfinal hockey action takes place on Wednesday. The first game of the day will see the top-seeded Americans take on Switzerland in a rematch of two Group A teams. The United States is hoping to advance to the medal round and grab a medal for the first time since winning silver in 2002. In the second game of the day, Canada will aim to advance to a medal game in a matchup against Russia. 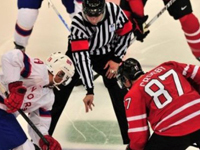 Canada suffered a 2-0 defeat to Russia in the quarterfinals four years ago and has not bested either Russia or its predecessor, the Soviet Union, since 1960. The third match will have Finland and the Czech Republic taking the ice in a matchup of two medalists from 2006. Finland won silver in 2006 while the Czech Republic took bronze. Lastly, Sweden and Slovakia will square off. Sweden is hoping to repeat in gold while Slovakia is looking to medal for the first time since 1992, when it won bronze as a member of Czechoslovakia. Sports Network has contributed to the report.